CANCELLED: Due to low participation registration and possible damage or unsuitable conditions to the trail from the recent deluge of rains, EASL is canceling the trail ride this Saturday, June 11. Sorry for any inconvenience this may have caused those who had already signed up. If enough interest is generated later this fall, we may try to reschedule. Any questions at all, call 5718101. *CHANGE* Kisatchie Trail Ride is scheduled for (new date) Saturday, June 11. 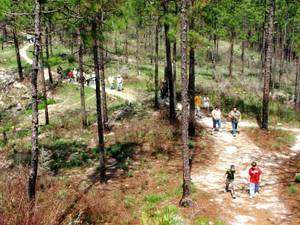 EASL is planning a trail ride to the Sandstone Trail in the Kisatchie National Forest projected to be on Saturday, June 11. The date will depend on the trail’s availability, depending on the rains toward the end of May. We will monitor closely through June 4 if the trail is usable. The ride is for regular 4 wheelers — no side by sides. They are too wide for the trail bridges. This will be a slow paced, family encouraged ride, not a race. There are many nature sights on this 26 mile trek. Riders will need to bring your own provisions: water, food and drinks, so please be self-contained on your bike. Camping is available. Any questions call Warren Hebert at 225-571-8101 or email at warrenh3@eatel.net. Remember to check back about the date as it gets closer to the date. 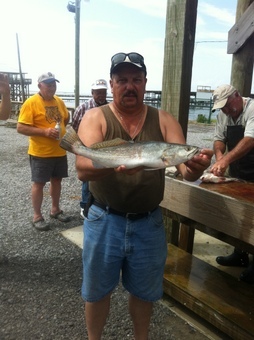 EASL’s Terry Melancon Saltwater Challenge will take place Friday, July 17 for registration and social, and conclude Saturday July 18th with weigh in, awards and fish fry. All activities including registration, eating, socializing, weigh-in, awards, etc. will take place at the camps behind the Cajun Holiday Motel. This is located on the left just past the Grand Isle Bridge. We will rent 3 camps. The camps will be reserved for the first 30 people who pay $120 each for the entire weekend starting Thursday night. This is non-refundable, if you pay and cannot attend it will be up to the individual to find someone to take their place. Currently there are 11 unpaid spots still available. Of those spots, six have been requested but not paid for. So with all that said. If you want a bed in one of the three camps, please get your money to Torrey or Keith soon. Cajun Slam; (optional $10/team; winning team takes all) Combined weight of each team’s biggest; Red (under 27”), Trout, & Flounder. Any fish weighed-in for the Slam, can also be entered in the other categories. Method of catch: Hook & line only; no flounder gigging, netting, etc. 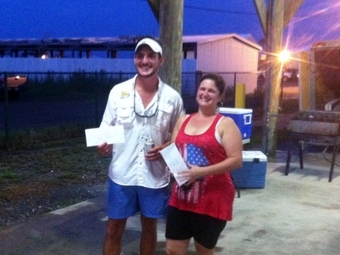 For the second consecutive year, foul weather proved to be the most challenging part of the “Terry Melancon Saltwater Challenge”. 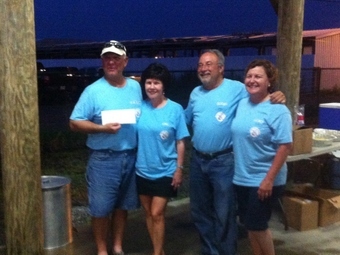 EASL hosted this popular annual event for the tenth time, July 17 through 20 in Grand Isle. Turnout was a little lower than usual, probably due to the 70% chance of severe thunderstorms that was forecasted. But most of the regulars were not deterred, and even when that 70% turned into 100, they certainly didn’t let it spoil their fun. The festivities didn’t officially kick off until Friday evening, but many folks extended their weekend by arriving a day early for some extra fishing and crabbing. EASL reserved three nights at two brand new camps, located adjacent to each other and right on Caminada Bay. Twenty-five members spent the weekend there, and the camps also served as the perfect headquarters for event activities. The Friday night registration supper featured a full 18-gallon pot of delicious jambalaya cooked by Charlie Moore. It was as good as it gets, but it almost didn’t happen! At about 3 that afternoon, just as Charlie and his help were getting started, a terrible thunderstorm blew through for about an hour with heavy rain, lightening, and gale force winds – everyone was soaked. But after the storm finally passed through, it calmed down nicely and Charlie was able to do his thing – just a little later than planned. At the registration, thirteen teams, a total of 40 people, signed-up for the Challenge. At around 3 a.m. Saturday morning, anxious fishermen were awakened by the distant rumble of approaching thunder. The storm was returning, and well before daylight the entire island would be slammed with high winds, heavy rain, frequent lightening and thunder so loud it rattled the dishes in the camp kitchen. It would have had to get better to be called a hurricane, and this went on all morning. But to everyone’s surprise, at around noon the storms finally cleared out, the wind calmed, and the sun even came out a little. There wasn’t much time before the 3 p.m. deadline so most people left the boats on the trailers, grabbed their tackle and headed up Hwy. 1 for some side-of-the-road tailgate fishing. The strategy didn’t work for everyone, but enough fish were caught to fill out every category, and more importantly, provide supper that evening. And a fine evening it was; a beautiful island sunset, great food, good friends, and even some live entertainment. Good times, for sure. 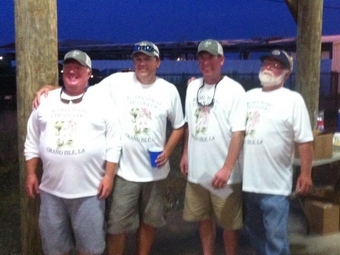 Team “Bama Toad Stranglers” Torey & Joe Hayden, James Mason, & Len Higginbothom took 2nd place in the category “2 Largest Reds under 27”. Team “Optomism”; Vince Diez Jr (pictured), Valerie & Brad Hymel (not pictured) placed 1st in the “Largest Trout” category; and 2nd place in the “5 Largest Trout” category. At right is Krissie Deshautelles of Team “Fishy Business”. Krissie was the award presenter for the evening. Barney Callahan & grandson Dominic , part of Team “Red Runners”. Charlie Moore caught the undisputed biggest trout of the weekend (one day too early). Charlie cooked an awesome jambalaya for everybody Friday night. 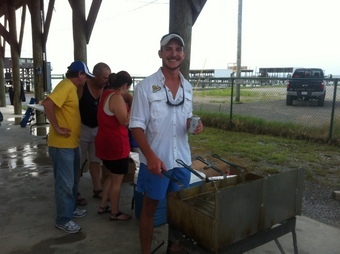 Vince Diez Jr. was the head chef Saturday night. Fresh caught fried fish & french fries. 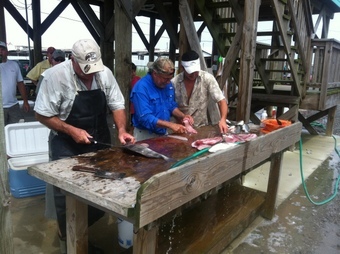 Fish cleaning experts Barney Callahan, Vince’s Sr. & Jr. gave a fish cleaning clinic. 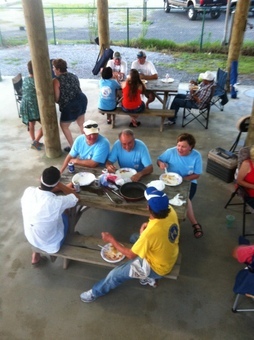 Good friends enjoying the Friday night supper; Jambalaya & white beans by Charlie Moore. Good as it gets! 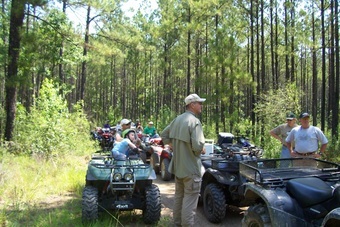 POSTPONED – Join EASL members on an ATV trail ride in Kisatchie National Forest on Saturday, May 17th. If interested contact Francis Gautreaux at 225 715 5749 about the logistics, including time to meet and where. 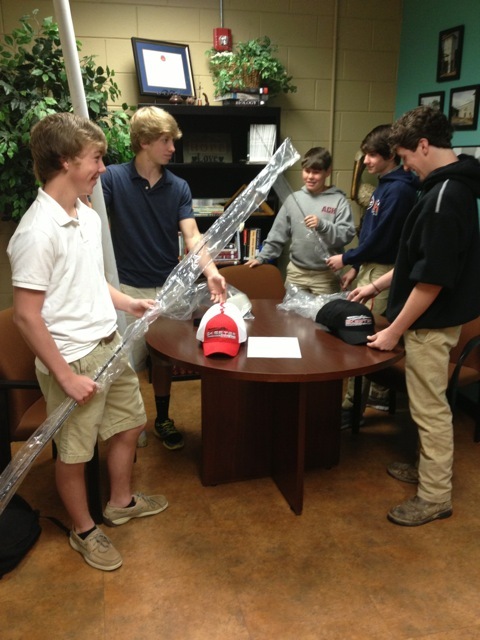 GONZALES, LA……..The 2nd Annual Louisiana High School Bass Classic is set for March 23, 2013. The tournament is sponsored by Ascension Christian High in Gonzales and students there are working hard to promote fishing as a competitive sport among area high school students. Ascension Christian High Principal Mark Pellegrin says the Louisiana High School Bass Classic is the first attempt to coordinate a fishing competition among area high school students. Pellegrin says, fishing, like other sports, should be a part of the high school experience. “High schools provide students with competitive sports all year; however, fishing isn’t one of them. I think it’s a great opportunity for schools to encourage students to participate in one of the most competitive sports in Louisiana, fishing,” Pellegrin said. 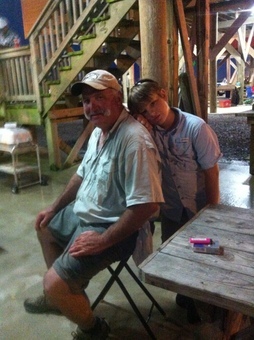 He added that organizing an annual competitive fishing tournament gets young people involved in learning more about the sport and gives youth an opportunity to appreciate the wealth of natural resources in south Louisiana and the importance of conservation. Wesley Johnson, President of the East Ascension Sportsman’s League, a local non-profit conservation organization, agrees with the whole idea of organizing a tournament among high school students. “The East Ascension Sportsman’s League is excited and honored to be a sponsor of the Louisiana High School Bass Classic. We strive to get our high school kids involved with nature and conservation. We can’t think of a better way of doing that than sponsoring a high school bass tournament,” Johnson said. Tournament entries must be two-member teams and one member must be a high school student. Boats will launch from the Manchac Boat Launch in North Pass, Louisiana. Entry fee is $40 per boat. For more information please contact Ascension Christian High School at 225-622-2800 or Wesley Johnson at (225)324-3035.